If you're looking for a hotel for your Death Valley National Park visit, you need to know a few things first. 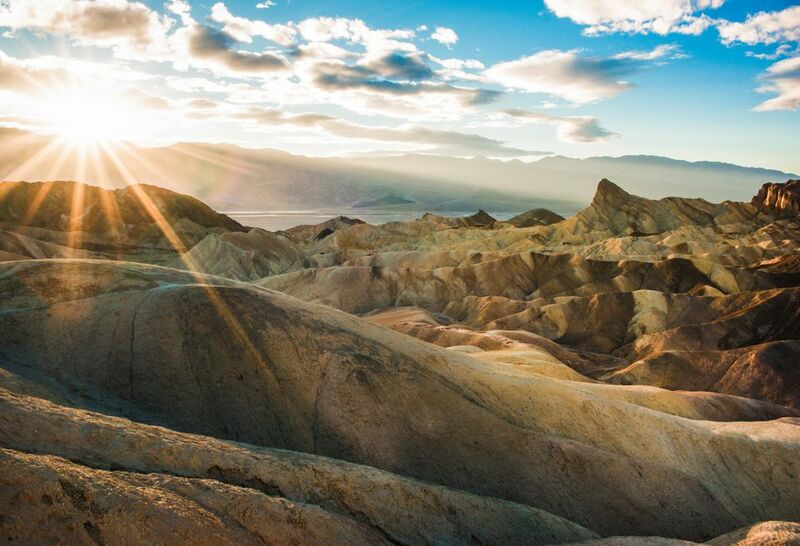 Death Valley is one of the largest in the country, covering 5,262 square miles. That's 50 percent larger than Yellowstone and 2.5 times the size of Grand Canyon National Park. Grand Canyon has eight hotels, and Yellowstone has nine. By contrast, Death Valley has only three hotels — four if you count one that's 55 miles from the visitor center and accessed by driving over a high mountain pass. Staying in a nearby town isn't very practical. The nearest town that has any kind of hotel, motel, or another place to stay is at least a substantial drive away (20 or more miles) and it's more than 100 miles to a larger city that has big, posh hotels for you to relax in. All of that means that your best option for Death Valley lodging is to choose one of the in-park hotels or go camping. These are their pluses and minuses. The Oasis at Death Valley Resort is centrally located in the park. You'll find two hotels there, two campgrounds, a few places to eat, and a small store. The Inn at Death Valley (formerly the Furnace Creek Inn) is one of those grand national park hotel built in the early twentieth century when the parks wanted to be sure that the rich and famous would be comfortable during their visit. It has a spring-fed swimming pool, tennis courts, and a restaurant. The Inn is open mid-October through mid-May only. For the other months The Ranch is available. The Ranch at Death Valley is a less fancy Death Valley hotel with comfortable, motel-style rooms. It's more affordable than the inn and open year round. Stovepipe Wells is on the north end of Death Valley, near the Mesquite Sand Dunes. It's both simple and affordable. The motel at Stovepipe Wells has a restaurant, swimming pool, and (extremely limited) Internet access. There's also a small store and gas station across the street. They also have camping, including an RV park. It's about a half hour's drive from the Oasis at Death Valley Resort. You'll have to drive 35 miles southwest of Stovepipe Wells and about 60 miles from Furnace Creek. To get there, you have to drive over Emigrant Pass, which is 5,318 feet elevation (1.6 km). Panamint Springs is the least expensive Death Valley (by a small margin), with limited WiFi Internet access. They also have an RV Park and allow pets in both the hotel and campground (extra fee). Besides the long drive to get there and back, Panamint Springs has some drawbacks. In the town of Death Valley Junction, southeast of Furnace Creek is the Amargosa Hotel. The adobe building was constructed by the Pacific Coast Borax Company in 1924. Visitor reactions to it are mixed, but some rooms are decorated with charming murals. Just across the state line east of Death Valley, 35 miles from Stovepipe Wells and about 50 miles from Furnace Creek, you'll find several hotels, campgrounds, and a couple of casinos in Beatty, Nevada. It's not the most convenient place to anchor a Death Valley visit, but prices are low. Beatty may also be a good choice if all the Death Valley hotels are filled up. Beyond that, you'll drive 100 miles or more to hotels in Lone Pine or Baker, CA or in Pahrump or Las Vegas, NV. Want to see polar bears in the wild? Here's where you can do just that!